Pues seguro que hay muchas ideas en Europa, pero no podemos conocerlas todas... ¿o tal vez sí? 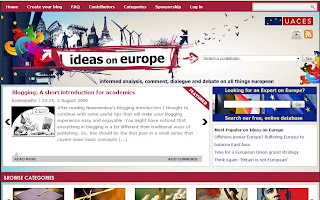 Eso es lo que parece que quieren los ingleses con la web "Ideas on Europe" que nos ha recomendado Eurodatum. Hablamos de esta web porque tienen un curioso buscador incorporado "Looking for an expert on Europe?" "¿Busca un experto en Europa?". Desde luego, hay que probarlo para saber si hay alguien realmente experto en asuntos europeos. Además puedes crear tu blog e incorporarlo a esta plataforma y convertirte con "contributor" y os lo doy en inglés porque si estáis considerando hacerlo, tendrá que ser en la lengua de Shakespeare. Así que ¡suerte! Esta es mi idea sobre Europa en la elección de los Juegos Olímpicos, puede que te interese el enfoque temático. Perhaps they need someone to blog in Spanish? The more the merrier! Why don't you ask them? Personally, I think each country should use their language to spread the word on EU affairs, thus this platform could be use for English speakers. For Spanish speakers we have many others such as "www.queeuropaqueremos.com" or "http://maseuropa.ning.com". I agree with you of course. But I also think that it is important to engage with people outside of your own country as well otherwise the discussions become very insular. Why not try and provoke a positive response from the English by exposing them to the Spanish language? Then English are very lazy with languages (like me)and they will never fully embrace Europe unless people prod them a bit. Ok, I will see what can I do. I have already known that you would ask me for a contribution. My problem is the lack of time but (and this is my commitment), I will write a post in Spanish for Ideas on Europe very soon.